* When you need a thicker sound, try real double-tracking rather than ADT (Artificial Double Tracking). In other words, play the same part twice over on two different tracks. Depending on the player, you may get better results by muting the original part until the new part has been recorded. If real double-tracking is too difficult, use a pitch-shifter to add a small amount of delay and detuning to fake the effect more convincingly than chorus. * When DI'ing, you can still use a small guitar amp to monitor what you're playing. This often makes playing seem more natural and the acoustic coupling between the speaker and guitar strings will add life to the sound. Even a small battery-powered practice amp can help you deliver a better performance. At one time, recording electric guitar meant putting a mic in front of an amp and hitting the record button. Of course, you can still do it that way, and in many instances such an approach yields perfectly acceptable results. But there are also viable DI alternatives that may be more convenient in a home recording environment. The fact that guitar sounds vary so much according to the instrument, the player, the amplifier and the recording techniques employed is one of the great attractions of the instrument. But while no two players will ever sound quite alike, there are a few general recording rules that can help achieve consistently good results. It would be wrong to try to define a single 'foolproof' method for guitar recording, so instead we've pulled together a few different tricks, tips and ideas that will help you get the results you want, while still providing plenty of scope for experimentation. As ever, if you get a result by breaking a rule or doing something in an unorthodox way, that's fine. In music, the end always justifies the means! Although a lot of engineers prefer to mic up the single, best-sounding speaker cone of a multi-speaker cab, some blend the sounds of more than one. Steve Churchyard: "If I'm using a 4x12 cabinet, I find two of the best-sounding speakers, and I'll put an SM57 right on axis and right on the cone of both those guys. Then I'll mix them in the control room, combine the two together. It seems a little different than just using one mic. It's not twice as good, but it's just mixing the character of two different speakers." While recording AC/DC's Back In Black, Tony Platt used a pair of condenser mics to pick up different speaker cones and give a wider sound to each guitar: "I developed a technique for recording guitars with two microphones roughly pointing at different speakers, which can be spread out in the stereo mix so it's not just a series of mono point sources. It makes for a more open-sounding guitar. That sound suited their particular technique, which involved Angus and Malcolm playing the same chords but with different inversions to get a very big unison guitar sound." Hugh Padgham adopted a similar tactic for recording Andy Summers' Roland JC120 when working with the Police: "The chorus [was] always switched on in order to produce the slightly out-of-tune guitar sound that was all the rage during the early '80s. The amp's two 12-inch speakers would each be close-miked with a Sennheiser MD421, panned left and right  one speaker would produce a straight signal while the other would be chorused, and these would sometimes be double-tracked the other way around in order to produce an especially wide stereo picture." Of course, no-one says you have to use the same mic on each speaker cone. For example the SOS interview with Toby Wright shows an SM57 and an MD421 on separate speakers, and Don Smith mentioned using an SM57 and an AKG C451 on separate speakers when recording Keith Richards. Sylvia Massy Shivy also uses the SM57+MD421 combination, but sounds a note of caution when deciding on the exact positioning of the mics: "You have to be very careful with phase, just check it until the signal is the strongest." 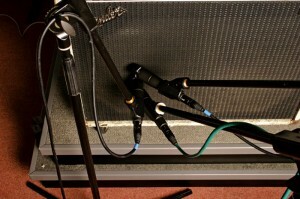 Coincident dual-mic techniques are commonly used by professional recording engineers and producers. Not only does the close positioning of the mics help to minimise problems with phase: the mix engineer is also left with plenty of control over the texture of the sound without the need for radical processing. 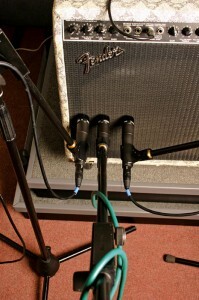 The 'phase EQ' technique: three mics (two close mics and another further from the amp) are positioned to form a triangle. The faders on the desk (or in the DAW) can then be raised or lowered for each signal. This alters the phase relationship between them and provides an interesting and, according to some producers, less intrusive alternative to conventional EQ. In response to Bill Price's comments about matching the phase of different close mics, I lined up a Shure SM57 dynamic mic and a small-diaphragm Shure KSM137 condenser mic on axis, over the centre of the speaker cone. With the KSM137 around six inches away from the grille, I started off with the SM57 an inch further away and then moved it (while recording) through a distance of around two inches, ending up with it an inch closer to the grille than the KSM137. The third audio example combines the SM57 and KSM137 mic signals at equal levels to demonstrate the tonal changes created by phase-cancellation between the two mics. The first three audio examples here are recordings from three mics set up in the 'phase EQ' configuration that Jack Douglas describes in the main article. For the final example I've tried to demonstrate something of the range of sounds available using only the fader and phase-invert button of each mic channel. "I've always thought that most people mic amps too closely," comments Alan Parsons. "They supposedly make up with an ambient mic, but I much prefer to find a mic position that works and process that, rather than mix in too much ambience." Despite Parsons' disapproval, though, a lot of the engineers I researched divulged that they use additional ambient mics to capture more of the sound of the room in which the guitar cab was recorded. For example, Al Schmitt starts with the traditional SM57 close mic, on axis but a little off the centre of the cone. "Then I'll put a really good mic up  maybe a Neumann U67 or an M50  for the room... It could be anywhere from 15 to 20 feet away." It's worth noting that the M50 is an omni microphone and, although the omni polar pattern is only very occasionally mentioned for close-miking, it makes a much more sensible choice for capturing natural room ambience. Tony Visconti is also into using ambient mics: "I'm very much a fan of the room sound, too. I always record it if it's a real heavy rock guitar with power chords and crunches and all. I'll go around the room and clap my hands and I say, 'Put the mics there, that's it.' Quite often, I'll turn the room mic towards the studio window, and you'll get a reflection of the guitar sound  not directly facing it, because you're looking for reflections." Although he states in the same interview that he'll try to use a pair of U87s for ambience if possible, he's also mentioned elsewhere using PZM mics as an alternative. Perhaps the most dramatic of ambient mic techniques, though, comes courtesy of Chris Tsangarides. His 'Vortex' involves using studio screens to build 30-foot-long walls along each side of the guitar cabinet, creating a flare shape (apparently inspired by the shape of a bass bin). Within this flare, he places a close condenser mic and typically another couple of condenser mics with different distant positionings, perhaps at 15 and 30 feet away. "I walk around while the guy's playing and find a sweet spot and put the mic there", says Chris. By panning the distant mics to the opposite side of the mix from the close mic, you can create interesting panning effects for solos. "If it's a rhythm part, you get this huge sound because the whole thing is spread across the stereo spectrum." When double-tracking lead or rhythm parts, a useful trick is to reverse the panning of the direct and distant mics. "If there were two guitarists in a band, I would record them like that, so you got a wall of sound that had a transparency that would allow the drums and bass to come through." While experimenting with the Vortex for this article, I was impressed by quite how well the ambient mics seemed to turn a close-miked guitar sound into something that sounded like it was on a record, but the downside of this approach for most home recordists will be that the Vortex is not easy to recreate in a smaller studio  so I thought I'd pass on some ways I found to make it more manageable on a smaller scale. One problem most small studios have is that they don't have large numbers of screens, but in practice I found that I was able to get decent results by putting the guitar cab in the corner of the room and using one or both of the room boundaries in place of the screens. Visconti's trick of aiming ambient mics at the studio glass also turned out to be handy to increase the apparent distance of the farther ambient mic. Let's look at how the professionals go about combining the close and ambient techniques we've looked at so far, in order to create specific custom setups for different recordings. Joe Barresi, for example, relies heavily on the trusty SM57 and MD421 combination, but he'll choose from a variety of other mics to give character to particular sounds. "The two microphones I use most for recording electric guitars are the Shure SM57 and the Sennheiser MD421, often both, close up, placed at the edge of the speaker, where the speaker centre meets the cone, or, if I'm looking for a more bright sound, dead centre. When I want more low end, I may have an AKG C414 on there, and when I'm after a little more personality, a Neumann U87, backed up a foot, or a ribbon mic, like the Royer 122, or an RCA BK5 or 77." Eddie Kramer has a slightly different approach, working from a familiar setup of favourite close and ambient mics (including the Beyerdynamic M160 ribbon mic) and then mixing them together to taste. "I use a three-mic technique: an SM57, an MD421 and an M160, all in a very tight pattern. Then I can pick and choose the tone quality, because each mic is totally different. I combine these together, and then I put a U67 away from the amp to get the ambience." For his work on Supernatural, Glenn Kolotkin turned to elaborate multi-miking as a way of managing Carlos Santana's complicated setup. "I used multiple microphones on Carlos' guitars: Electrovoice RE20s close, Neumann U47s further away, an SM56, U87s. He was playing through an assortment of amplifiers at the same time, and by using multiple microphones I was able to get just the right blend." Complex though some of these techniques are, probably the most powerful use of multi-miking I've encountered during my investigations comes courtesy of Jack Douglas, who makes creative use of phase cancellation between microphones. "For guitar overdubs, the best EQ in the world is the phase EQ, which you get by using multiple mics on a speaker. For example, take a Shure SM57, a Sennheiser MD421 and your favourite condenser, and set them up in a triangle with the two dynamics at an angle up against the grille, but off axis. Then take your favourite condenser mic, put a 10dB pad on it, and place it about a foot away, facing the speaker, on axis. "Bring up one mic at a time and get it to optimum level on your board. To check that they're all in phase, make sure the signal is adding and not subtracting as you add in the other mics. If not... reverse the phase. Then start to put up each mic, one at a time... as you move the faders back and forth, you'll hear the greatest EQ, because of the phase relationship... Then if you flip the phase on one of the mics, you can really have some fun  it'll act like a filter." Having tried out this technique, I have to say that it's something of a revelation to hear the enormous range of radically different sounds it makes available. When you start inverting the phase of a mic, it sounds like the most extreme EQ you've ever heard, which means that you can substantially reinvent guitar sounds at mixdown without using any heavy processing. For even more sonic mileage, you can also take a leaf out of John Leckie's book and process each of the three mic signals independently. Jack Douglas also points out a beneficial side-effect, in his experience, of recordings made using the phase EQ approach: "When you build a mix  I don't care if it's four tracks, eight tracks, or 96  the real nightmare is when you put something up and the only way you can hear it is by blasting it. There's nothing worse than putting up something you're excited about, and it's gone. If you [record guitars] like this, I guarantee that as soon as you put the sound in the mix it will be there. Not only that, it won't wipe out everything else in the mix, because it will have such a separate and distinct character." Even working on the assumption that you're only using one mic, the professionals have an awful lot to say about where you might put it. For a start, it seems to be fairly common practice to audition the different speaker cones of your guitar amp. "They're supposed to sound the same," says Roy Thomas Baker, "but if you're using a 4x12 cabinet, each of these four speakers may sound different." While there's nothing necessarily wrong with plonking your mic right at the centre of the speaker cone if it gets what you're after, a lot of producers take the time to experiment with different positionings off axis, where the sound is typically warmer. Mike Hedges: "Depending on where you have [the mic]  outer speaker or inner speaker  you get the difference in tone from the edge of the speaker and the centre of the cone." In fact, Mike Clink also tries small changes in position even when working with basically on-axis sounds. "I'll point [the SM57] exactly dead on, though I might move it an inch or two to get the right sound." Directional mics, such as cardioids and figure-of-eights, exhibit different frequency responses off axis  broadly speaking, off-axis sounds tend to be duller, although it's a complex effect which is different for each model. Professional producers are well aware of this, and employ the effect to refine their sounds. For instance, Chuck Ainlay comments "I'll usually start with a [Shure SM57] on the amp; but not straight on axis with the middle of the speaker; it's usually off-centre, angled towards the middle of the speaker and generally just off the grille." Jay Graydon refers to a fairly similar setup: "I position the mic about one inch left of the edge of the speaker-cone centre, using a 22-degree angle, and about one inch back from the grille cloth." Andy Johns, on the other hand, has said that "the miking technique I used on electric guitars for years was two [Shure SM57s], one straight on, and one at 45 degrees. Put 'em together, and it always works." The question of how far away to place your mic really divides opinions. 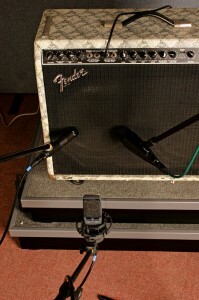 To compare the sound of the Fender Twin Reverb's two speakers, I placed Shure SM57s directly over the centres of the different cones, on axis and right up against the grille. This also gave me the opportunity to try out the dual-mic technique mentioned by Steve Churchyard. You can hear the range of sounds available from mixing the mics in the third audio example, which starts with the left-hand SM57, but then fades in the right-hand SM57 until, by the middle of the example, both mics are at equal level. The left-hand SM57 then fades out during the remainder of the audio example. 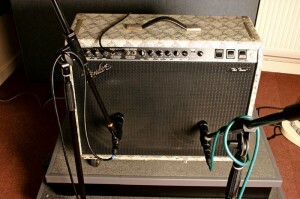 Here's a stab at Tony Platt's dual-mic AC/DC technique, using two large-diaphragm condensers, about six inches apart and pointing at different speakers, placed about six inches from the grille. In the third example I have panned the mics a little left and right respectively, to demonstrate the stereo spread effect he talks about. One of the things that initially surprised me was that coincident dual-mic techniques, where the two mics are placed as close as possible to each other to minimise phase cancellation between them, actually appear to be more commonly used than single-mic techniques. John Leckie explains: "There's an amazing difference in the sound and colouration you get from adjusting the balance of each of the mics, and you can get radically different textures depending on your mix of the two." The majority of favoured mic pairs seem to include the trusty SM57, but its most popular partner appears to be the larger-diaphragm MD421  users include Bob Rock, Bruce Fairbairn, Alan Winstanley, Joe Barresi, Simon Dawson, Stephen Street and The Matrix. Also high on the list is the pairing of the SM57 with a large-diaphragm condenser of some type, and Steve Churchyard, Toni Visconti, Jim Scott, Stephen Street, and John Leckie all name-check the U87 in this role. However, John Leckie states an interesting preference for an SM58 and U67 rig instead: "SM57s tend to be that little bit brighter than the SM58, which really isn't what you want when you're miking up an electric guitar amp. You really want to pick up a flat signal, an 'unstimulated' signal I suppose is the word... The U67 gives you the warmth and a broader sound." Referring to this setup, Leckie also explains more about what makes double-miking so powerful: "If you brighten up the U67, it's totally different to brightening up the SM58, so sometimes I'll add a little brightness to the 67 and a little compression. But between that combination, I find I can get pretty much everything I need. They're rarely used at equal level; sometimes I'll favour the SM58 with the U67 at 10-15dB down. Even 20-30dB down, just bringing it in, it's amazing the different colour you get  how much the tone of the guitar changes." Coupling an SM57 with a small-diaphragm KM84 condenser finds favour with Bill Price and John Fry, while Mike Hedges chooses his favourite Sennheiser MKH40. Bill Price also mentions the importance of finding a very close phase match between the two microphones. "What one had to do was balance those mics equally, grab a pair of headphones out in the studio that were turned up nice and loud, and fractionally position one of the mics so that they were perfectly in phase at high frequencies, because if you had one mic five inches away and the other six inches away you'd obviously get really bad phase shift that would take the top off the guitar sound." 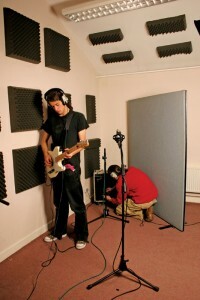 Beyond specific favoured mics, a number of engineers also mention more general principles when choosing pairs of mics for guitar recording. Jim Scott and Stephen Street both mention using a 'cheap' or 'bad' mic with a good mic (both give the SM57+U87 combination as an example). "Between the two you can find the ideal sound," remarks Jim, "and you can get brightness and fullness." Steve Albini, on the other hand, finds it useful to think in terms of blending 'bright' and 'dark' mics. "Normally I'll have two microphones on each cabinet, a dark mic and a bright mic, say a ribbon microphone and a condenser, or two different condensers with different characters." Eddie Kramer's discussion of his Hendrix sessions reveals a similar preference: "Generally speaking, it was either a U67 or a Beyerdynamic M160, or a combination of both, which I still use today. It might be slightly different, of course, but the basic principle's the same  a ribbon and a condenser." The 'Vortex' setup described by Chris Tsangarides, is a great way to add ambience. The setup pictured above is a variation created by the author for a small studio, where one of the walls was used in place of baffles for one side of the flare. To illustrate the possibilities available from ambient mics, I recorded the same guitar performance with three mics simultaneously: a Shure SM57 close mic on axis to the centre of the speaker cone and up against the grille, and a stereo pair of AKG C3000 large-diaphragm condenser mics a few metres away. The third audio example illustrates the range of sounds available by mixing the close and ambient mics. The example starts with the SM57, but then the ambience mics fade in until, by the middle of the example, all mics are at equal level. The close mic then fades out during the remainder of the audio example, leaving just the ambience. These examples give some idea of how Chris Tsangarides' Vortex technique can sound, even when adapted to suit a smaller room, as I've described in the main article. The guitar cabinet was set up in the corner of the room, with a single, large acoustic panel making up one side of the 'flare'. All the mics were large-diaphragm condensers: the first, an AKG C414B XLS, was on axis over the centre of the speaker cone, right up against the grille; the second, an AKG C3000, was two metres away, pointing at the cabinet; and the third, another AKG C3000, was four metres away, angled to catch the reflected sound from the control-room glass. The final audio example starts with the C414B XLS close mic on its own, then fades in the two ambience mics (panned a little left and right) until, by the middle of the example, all the mics are at equal level. The close mic then fades out during the remainder of the audio example. When it comes to recording electric guitar, Jay Graydon's (Producer - Airplay, Jarreau) views on mic choice are pretty clear: "I have tried so many dynamic mics over the years, and always come back to the Shure SM57." He's not alone: this robust, cardioid, dynamic microphone is more often mentioned in relation to electric-guitar recording than any other. Why such a strong preference? These days, force of habit has got to be part of the answer, but there is also a lot about the microphone's frequency response which suits guitar recording. For a start, the sub-200Hz response roll-off reduces low-end cabinet 'thumps', which might otherwise conflict with the kick drum and bass in the mix. This also compensates for proximity boost when the mic is used very close to the speaker cone. 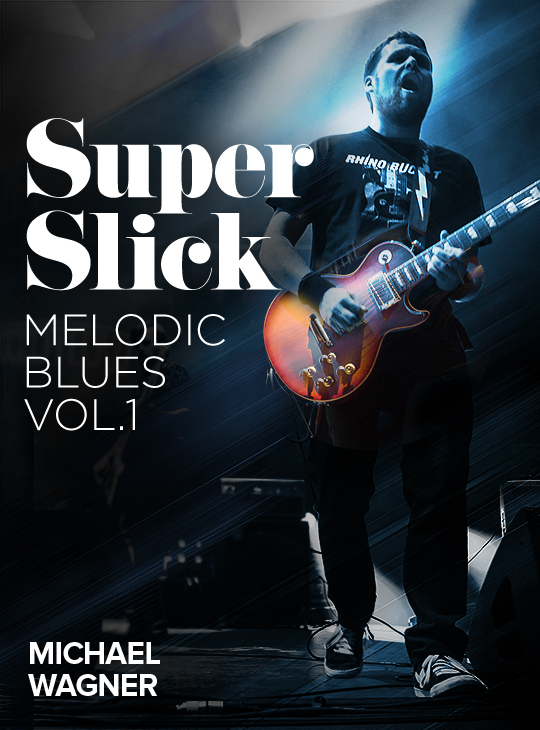 However, there's also a slight 'suckout' at 300-500Hz, an area where muddiness can easily occur, and a broad 2-12kHz presence peak, which adds bite and helps the guitars cut through the rest of the track. Producers as varied as Chuck Ainlay, Mike Clink, Mike Hedges, Gil Norton, Bob Rock, Elliot Scheiner and Tony Visconti all claim to have recorded electric guitar using this mic alone, and it would probably be fair to say that it's often the first mic to come out of the locker for many more than these. Sennheiser's cardioid MD421 crops up almost as frequently in interviews, and has a wider frequency response, none of the low mid-range suckout, and an even heftier sensitivity boost upwards of 1kHz. This microphone also has a larger diaphragm than the SM57, and the off-axis response anomalies of the larger diaphragm, in particular, give a different character to the sound. Although obviously very popular, this mic seems more often to be used in combination with other mics than on its own. The same goes for Electrovoice's RE20, which counts Steve Albini, John Fry, and especially Glenn Kolotkin amongst its friends. "I like to use RE20s on most amplifiers when they're available", says Glenn, "because the quality is great and they can take really high levels. They're very directional and they're great for rock and roll." The mic also exhibits an unusually wide and flat frequency response and is specially designed to resist proximity effect. For a rock sound, many (though not all!) engineers will use a dynamic mic placed close to the speaker (sometimes on its own, sometimes in combination with other mics). Shure's SM57 (left), Sennheiser's MD421 (centre) and the Electrovoice RE20 (right) are popular choices for this application. Alan Parsons: "I always use condenser mics on a guitar amp, never dynamics  they're too telephoney. That's an unfair expression for a very good dynamic mic, but by comparison to a condenser, you're not going to get the bottom end." 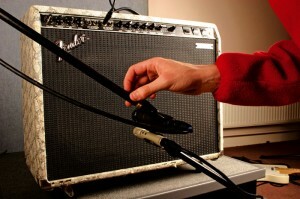 While this stance is more hard-line than that of most engineers, condenser mics are, of course, regularly used for recording electric guitars. However, in practice they rarely seem to be used on their own and are very often lined up alongside the trusty SM57. Large-diaphragm models are popular, with Neumann mics particularly favoured. The famous U87 studio workhorse is probably the most commonly mentioned, but it's by no means the only contender. Eddie Kramer, Steve Albini and John Leckie single out its predecessor, the U67, for example, while both of the earlier U47 models (valve and FET) receive name checks from people such as Steven Street, Glenn Kolotkin, Butch Vig and Bruce Botnick (note that U47s were marketed under both Neumann and Telefunken brand-names, but they're essentially the same mics). Neumann aren't the only game in town, though: AKG's C414B-ULS is probably joint most popular large-diaphragm model alongside the U87. The characteristics that producers most often seem to be looking for in these mics are their extended frequency response, especially at the low end, and the slightly softer, more diffuse sound imparted by the large diaphragm. These mics also tend to boost the 5-15kHz region, but this boost is rapidly lost as you move off-axis (it is inherently difficult to design a large-diaphragm capsule with an even off-axis frequency response). Small-diaphragm condenser mics, on the other hand, tend to have flatter frequency plots and a better-behaved off-axis response, giving a sound sometimes described as more focused, but they seem to be less commonly chosen by the interviewees than large-diaphragm ones. Neumann's KM84 seems to be the most regular choice of small-diaphragm condenser, and numbers John Fry and Bill Price amongst its high-profile users, while Sennheiser's MKH40 warrants a particular mention from Mike Hedges: "I started using [these mics] when I was working with the Beautiful South. I started off with two and now have more than 20. I think they were originally designed for classical recording, because they have very high gain and very low noise. This means that you can get a very clean sound. They also accept massive amounts of volume, so you can put one against a guitar amp on full and it will take it." Hedge's concern about the ability of the microphone to handle the sheer volume of some guitar amps is echoed by several of the other producers, who make a point of mentioning that they switch in a condenser's 10dB pad when recording electric guitars. Surprisingly, perhaps, given their reputation for fragility, ribbon mics also seem to be widely used for electric guitar, with models from Beyerdynamic, Coles, RCA and Royer all putting in appearances. Producers using ribbons include Thom Panunzio, Joe Barresi, Steve Albini, Ed Cherney, Bill Bottrell and Butch Vig  Eddie Kramer even goes as far as to say that "to me, the best guitar mic is the Beyer M160, which I've used for 30 years on Hendrix, on Zeppelin, on everybody." One trait of most ribbon mics is the figure-of-eight polar response, and this is often exceptionally consistent across the frequency range. This polar pattern means, of course, that ribbons tend to pick up a little more room ambience than cardioids, given that the polar pattern is as sensitive behind the diaphragm as it is in front. Ribbon mics are also often characterised as sounding 'smoother' compared with typical condenser microphones, partly because their construction avoids the high-frequency diaphragm resonances normally inherent in condenser designs. 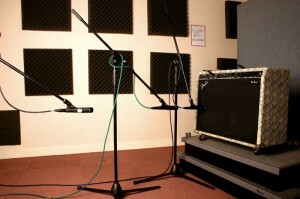 Popular condensers: when it comes to condenser mics for guitar-cab miking, the AKG C414 (in its various flavours  the C414 B-ULS is pictured above left) and the Neumann U87 (centre) are both popular choices. Some producers also frequently look to the U87's predecessors, the U47 valve (pictured) and FET models, and the U67. Audio Examples: Mic Placement These examples show how different mic positions can affect the tone of a recorded guitar cabinet. These examples were recorded simultaneously via three on-axis SM57s, directly on the speaker grille: the first at the centre of the cone, the second at the edge, and the third midway between the two. Three SM57s were placed as close as possible together at the centre of the speaker cone and directly on the speaker grille. The first was on axis, the second was angled at around 22 degrees and the third at around 45 degrees. Here, I have combined the on-axis and 45-degree mics to give some idea of the range of sounds available using the technique mentioned by Andy Johns. At the start of the audio example only the on-axis mic can be heard, but then the other mic fades in until, by the middle of the example, both mics are at equal level. Then the on-axis mic fades out during the remainder of the audio example. Here, three SM57s were placed on-axis at different distances from the centre of the speaker cone. The first was right up by the grille, the second at 12 inches, and the third three feet away. The speaker cone of a guitar amp will sound different when close-miked at the centre than when miked at the edge: it is worth experimenting to get the sound you want. How far away from the speaker cabinet the mic is placed has a significant impact on the recorded sound.